In the Southern constellation Tucana lies the Small Magellanic Cloud, a dwarf galaxy orbiting our own Milky Way galaxy and home to the bright star-forming nebula and cluster NGC 346 depicted here in this image together with its neighbour NGC 371. The densely populated star field covering the entire field of view is part of the central bar structure in the SMC. The image is constructed from exposures in three very narrow (3nm) wavelength bands corresponding to the emission profiles of ionised Hydrogen, Oxygen and Sulphur. The red hues correspond to ionised Hydrogen emission (H-Alpha), and bluer colours are ionised Oxygen (OIII). NGC 346 is a beautiful bright emission nebula in the central bar of the SMC. It is easily identifiable even in small telescopes as the brightest nebula in the SMC, and shows as an extended spiral shaped swirl surrounding a brighter centre which is home to the central star cluster. Near the core this nebula has a curious sharply defined edge curving around the cluster. The strong stellar winds from the young hot stars in the cluster have blown out the surrounding gas into diffuse filament-like structures extending far from the core region. It is interesting to imagine how impressive this magnificent nebula might have looked like if it was located in our own galaxy instead of in the SMC some 210,000 light years distant. A detailed close-up image of this nebula is available from the Hubble Space Telescope. 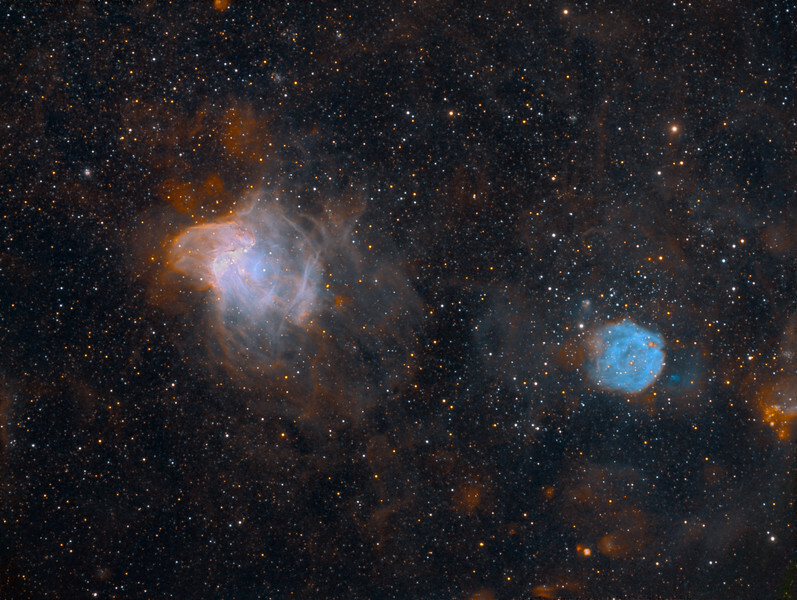 The neighbouring NGC 371 (to the right) is a large and diffuse star cluster, surrounded by a glow of emission which appears intensely blue in this narrowband image. The cluster itself has a visual diameter of 7 arc minutes, corresponding to a real physical diameter of 350 light years.